Detects mature macrophages in connective tissues which are situated in the vicinity of epithelia e.g. salivary glands, capsule of lymph nodes, thymus and various other organs. The antibody blocks the mouse macrophage galactose-specific lectin (MMGL). Tissue/ cell preparation (Mouse macrophage cell lines). Our Abpromise guarantee covers the use of ab15635 in the following tested applications. The antigen is found on the surface of connective tissue macrophages and their precursor cells in bone marrow. Macrophage cell lines (J774-1.6, RAW309Cr.1, WR19M.1) corresponding to mature macrophages express high levels of the antigen . Overlay histogram showing RAW 264.7 cells stained with ab15635 (red line). The cells were fixed with 80% methanol (5 min) and incubated in 1x PBS / 10% normal goat serum / 0.3M glycine to block non-specific protein-protein interactions. The cells were then incubated with the antibody (ab15635, 1µg/1x106 cells) for 30 min at 22ºC. The secondary antibody used was DyLight® 488 goat anti-rat IgG (H+L) (ab98386) at 1/500 dilution for 30 min at 22ºC. Isotype control antibody (black line) was rat IgG2a, kappa monoclonal [aRTK2758] (ab18450, 2µg/1x106 cells) used under the same conditions. Acquisition of >5,000 events was performed. 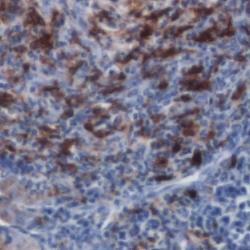 This antibody gave a positive signal in RAW 264.7 cells fixed with 4% paraformaldehyde used under the same conditions. Publishing research using ab15635? Please let us know so that we can cite the reference in this datasheet.